Ventilation is among the most important yet least addressed aspects of roofing systems today. Proper ventilation is composed of many components, of which attic insulation is seldom addressed. A poorly insulated attic can disrupt the ability for your roof to ventilate, resulting in damage of several types: mold, infestation, or corrosion. Some homes can experience ice damming along the gutter lines or sagging of the roof deck. Building codes for new homes are moving towards R-49 levels of insulation. Most previously built homes have R-19 (the higher the R-value, the greater the insulating power). New homes are getting appropriate levels of insulation, yet ones that have not been built under the new codes do not. Working with Owens Corning, Chase Construction North West, Inc. offers a solution! Owens Corning has developed a fantastic insulation product for new installation. The ProCat Loosefill Insulation System is Greenguard Gold certified for air quality, is formaldahyde free, contains a minimum 73% recycled content, and loses virtually no R-value over time. It doesn’t cause itching like other insulation can, and isn’t a food source for pests. Perhaps best of all, it can reduce your energy bill! A properly insulated attic minimizes heat loss and gain, potentially reducing energy costs by up to 20% and yielding a more consistent temperature room to room. The two most common types of insulation are fiberglass and cellulose. Owens Corning insulation is fiber glass, and it exceeds the quality of cellulose insulation over a range of issues. Cellulose insulation is often touted as having higher R-value per inch. This is not true given the density options of fiberglass products. Fiberglass is made from sand and other inorganic materials, and is naturally noncombustible; whereas, cellulose insulation is made from newspaper and is naturally combustible. To adjust for this, cellulose insulation is treated with fire-retardant chemicals, which can leach out and sometimes result in the insulation failing fire safety standards. Properly treated cellulose insulation burns at 450 degrees fahrenheit, the surface temperature of a 75-watt light bulb. Cellulose insulation settles about 20% over time (losing R-value), while fiberglass insulation settles less than 1% (maintaining R-value). Knowing whether your attic has the right amount of insulation and finding contractors who can fix it can be difficult. 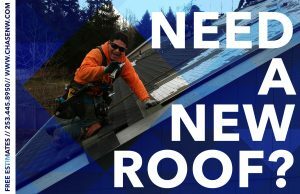 As roofing contractors, we have a unique ability to address this issue, because we can join the attic insulation installation to the re-roof installation on existing homes. 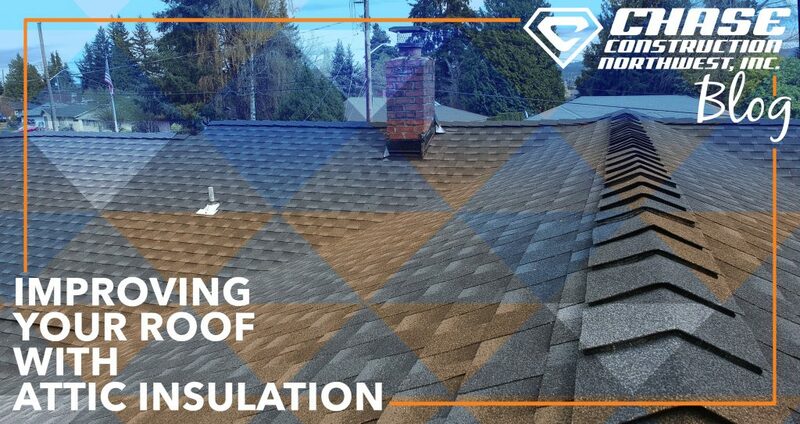 Since we’re already removing the old layer of roofing material, we can access the attic through the roof and install insulation without running the machine through the home. If you’re looking for a new roof, there’s never a better time to fix any attic insulation issue. Doing so helps extend the life of the roof by improving ventilation and potentially reducing energy costs! CHASE CONSTRUCTION NORTH WEST, INC. has been a family owned business since 2002! Give us a call at 253-445-8950 or fill out our quick estimate form! I had no idea that fiberglass could be used as insulation. My home is very old, so a lot of the insulation needs to be replaced. Thanks for all the great information on the different types of insulation and their benefits.